A working immune system is important for staying healthy – even for bacteria. 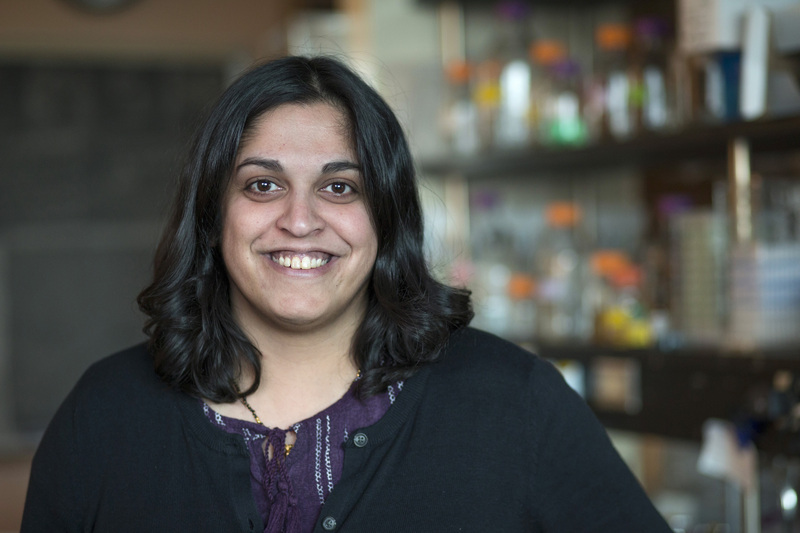 Sashital is fascinated by the bacterial immune system known as CRISPR (an acronym for Clustered Regularly Interspaced Short Palindromic Repeats). Commonly known for its usefulness in gene editing, CRISPR (pronounced “crisper”) is a genetic memory held in bacteria of DNA from foreign invaders. In the CRISPR system, a foreign DNA segment found in the bacterial DNA is used to make a matching RNA. This RNA in combination with a particular protein can find its matching DNA from a foreign body, such as a virus, during an infection. The RNA-protein combination will then bind to that DNA and cut it, rendering it useless. This system is commonly used for genome editing by creating a target RNA-protein complex that matches a certain area of DNA in plants or animals. The RNA will bind to the DNA at a particular location and the associated protein will cut the DNA, allowing for changes to be introduced in the repair process. In this way scientists can study what happens when particular genes are damaged or edited. The potential applications for CRISPR in gene editing are exciting and already contribute to a billion-dollar industry that will only continue to grow. Sashital’s lab works with many other researchers on campus who use CRISPR technology for genome editing in crop plants, to continue to improve the use of the CRISPR system as a tool for genome editing. But to really understand the system, she also must study how it works naturally as a bacterial immune system. An estimated 10^30 bacteria live on earth — that’s 10 with 30 zeros following it, a number you can’t really wrap your head around — along with an estimated 10^31 viruses, all at war with one another for survival. The composition of microbes in any particular location, whether it be deep in the ocean or inside of the human gut, is determined by these microbial interactions, many of which are not yet well understood. The CRISPR system acts as a defense system for bacteria in the microbe war that scientists are just starting to understand. She first asked one of those newly answered questions as a postdoctoral student at the University of California Berkeley — how was the CRISPR system able to search all the DNA — sometimes 4.5 billion base pairs are present — to find one foreign target? When she first asked the question, no one had the tools to answer it. But her recent work with Chaoyou Xue (’17 Ph.D. biochemistry) contributes to the answer. Xue developed a technique to visualize how the CRISPR protein searches DNA. He added a dye to the protein and then flowed the protein through a tiny chamber filled with DNA. 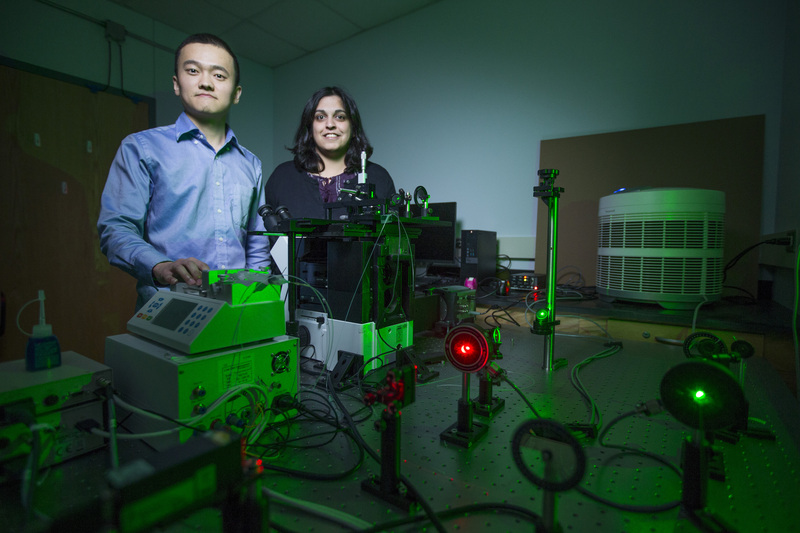 Using a type of laser microscopy available in the lab of Yeon-Kyun Shin, a professor in biochemistry, biophysics and molecular biology, the proteins are illuminated when they bind to the DNA. The technique allowed them to see that the protein was jumping around all over the DNA searching for a recognition site that always occurs next to the sequence that will need to be unwound. “By searching for the recognition site first, it can, in a more targeted manner, only unwind selected sequences,” Sashital said. The results have been published in the journal Cell Reports and she hopes they will add to the growing understanding of CRISPR as an immune system for the benefit of gene editing technique as well as other unforeseen applications.